I love your weekly project pages - great photos and great composition. Beautiful snapshots. Love the sky shot and the last one of Taylor. Very handsome young man. Have a great day! Wonderful photos this week. Gorgeous sky and that mountain view is so beautiful. Thanks so much for linking up. Hope you all have a wonderful weekend. Wonderful photos! Those mountains are gorgeous! And I agree with Danelle about the sky shot ... looks like Heaven! Full week for sure. Can't wait to see your pictures from this weekend. Oh the inner tube & that AMAZING sky- totally my favorites today! Great collage. The sky is breathtaking. I hope your boys have a great trip and you don't miss them too much. each one is gorgeous - but that sky shot is breathtaking!! what beautiful light!! Wonderful collage this week......that sky is absolutely STUNNING!!!!! Your photos are always so amazing. The sky shot is very beautiful! These are just lovely. I had to keep going back to that sky one (AWESOME) and those green grapes. Great photo collage and beautiful photos! That cloud shot is amazing! 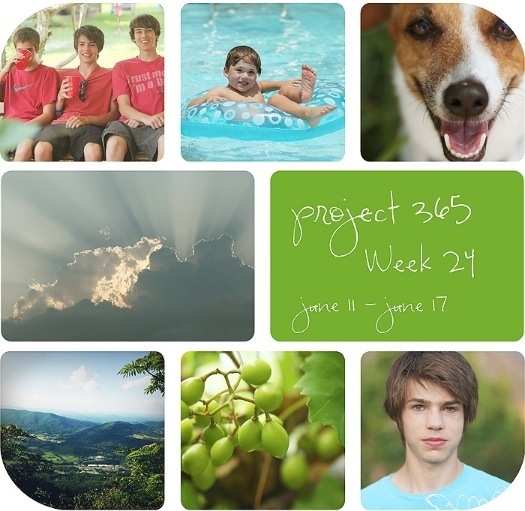 I like your 365 project collage, and your photos are wonderful! I love the silver lining behind the clouds. That is a favorite past time of mine and Brent's - seeing them together. It makes us smile b/c we say that is God in all of his glory shinging from behind the clouds. Great pics as usual.